A table representing the acreage of principle crops in Seminole County, Florida, during 1924. 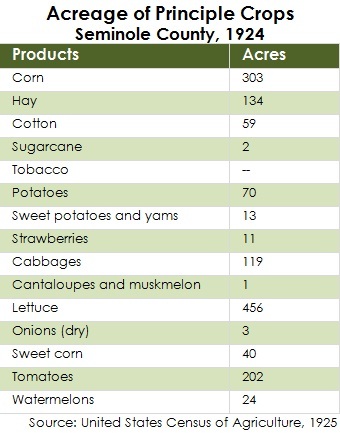 Crops such as corn, velvet beans, and dry edible beans were listed as grain and forage crops. Tame grasses and annual legumes were categorized as hay crops. Crops such as cotton, sugar cane, potatoes, and strawberries were listed as miscellaneous. Vegetables grown for sale included cabbages, melons, lettuce, onions, corn, and tomatoes. All of the fruits and nuts were listed under orchard fruits and nuts. In the early-1900s, Seminole County was known for its agricultural development and close proximity to shipping lanes. By the 1920s, citizens in Seminole County, particularly in Sanford, soon shifted their interests in making the area a tourist destination. 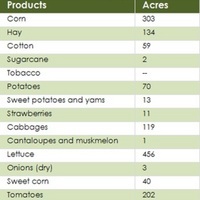 This trend is made apparent in the total value of principle crops listed by the U.S. Census of Agriculture in 1924. In 1919, principle crops were valued at $186,229 in comparison to drop in value in 1924 to $22,509 for the same identified crops. Original table by Laura Cepero, July 21, 2011. Originally created by Laura Cepero. Dicken, Samuel N. "Central Florida Farm Landscape." Economic Geography 11, no. 2 (April 1935): 173-182. Harper, Roland M. "Agricultural Conditions in Florida in 1925." Economic Geography 3, no. 3 (July 1927): 340-353. United States, and William Lane Austin. United States Census of Agriculture: 1925. Reports for States, with Statistics for Counties and a Summary for the United States. Washington: U.S. Govt. Print. Off, 1927. Cepero, Laura. “Acreage of Principle Crops, Seminole County, 1924.” RICHES of Central Florida accessed April 22, 2019, https://richesmi.cah.ucf.edu/omeka/items/show/3108.